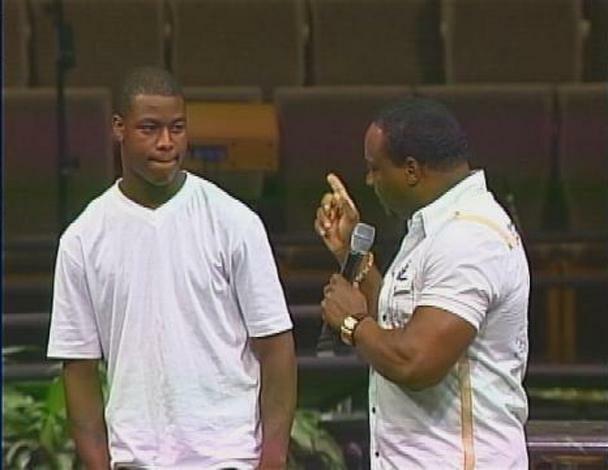 Anthony Boyd (left), shown here with Pastor Eddie Long, is accused of using his job as a security guard to allow a burglary at Long's church office. The shy 18-year-old ambled to the New Birth Missionary Baptist stage, called forward by a man he considered a mentor and father figure. It was, Anthony Boyd said as he watched a DVD of the September 2009 church service, the happiest moment of his life. "He's had a heckuva past," Bishop Eddie Long told congregants as he hugged a beaming Boyd. "When he heard the voice of God, he changed." Long then informed Boyd he was giving him a job at New Birth -- the same job that Boyd stands accused of using to help facilitate a burglary of roughly $100,000 in jewelry and electronics from Long's office inside the church. Two other young men were implicated in last June's theft -- both of whom later filed a civil lawsuit alleging sexual misconduct against Long. Only Maurice Robinson was charged with burglary; suspect Anthony Flagg was not charged due to a lack of evidence, said DeKalb County District Attorney's Office spokesman Erik Burton. Robinson and Boyd were offered entry into a pre-trial diversion program in exchange for having the charges dismissed. Robinson accepted "and is compliant with program requirements," Burton said. Boyd, meanwhile, is due to be arraigned on June 28. "Now since I'm the last man standing they're trying to make me the victim," said Boyd, 20, in his first interview since the burglary. He said he didn't complete the diversion program because "I'm innocent. I had nothing to do with it." Boyd is accused of using his position as a security guard to help Robinson gain entry into Long's office. No evidence has been presented, however, that Boyd participated in the actual theft of the missing items, which included a $35,000 Jorg Hysek diamond watch.